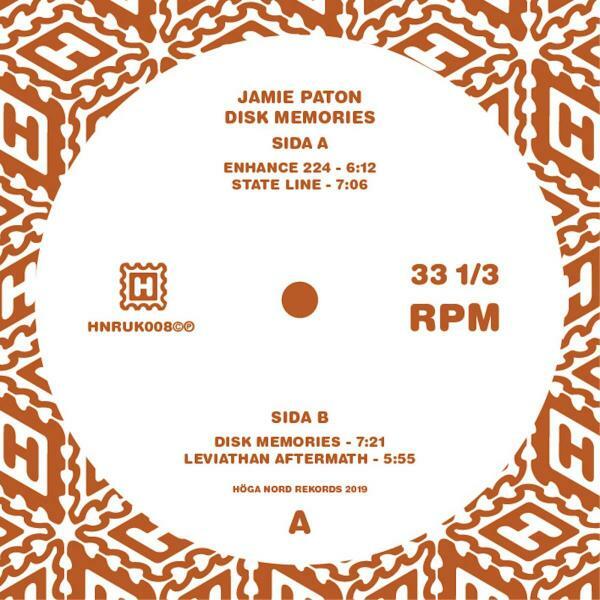 Jamie Paton makes music that could be described as 'Leftfield techno' or 'Slowmotion house'. 'Disk Memories' is his second release on Hoga Nord Rekords and Paton still work in the same spirit as on the previous HNR release from 2017. 'Disk Memories' is barren electronic music for the Brexit generation. Paton has established a dystopic electronic sound that aims straight at your frontal lobe, burns in your bones, and projects a lost Europe's anxiety on the grey London skies. The music breathes of the cold 1980's, a time of crisis in England's history and a vibe to be recognize in today's society: right-wing winds once again blows hard over the British Isles and Jamie Paton's music catches the insecurity the wind carries with it.